The newspapers are full of accounts of how residents banded together to assist those affected by the floods in the Helderberg last week. 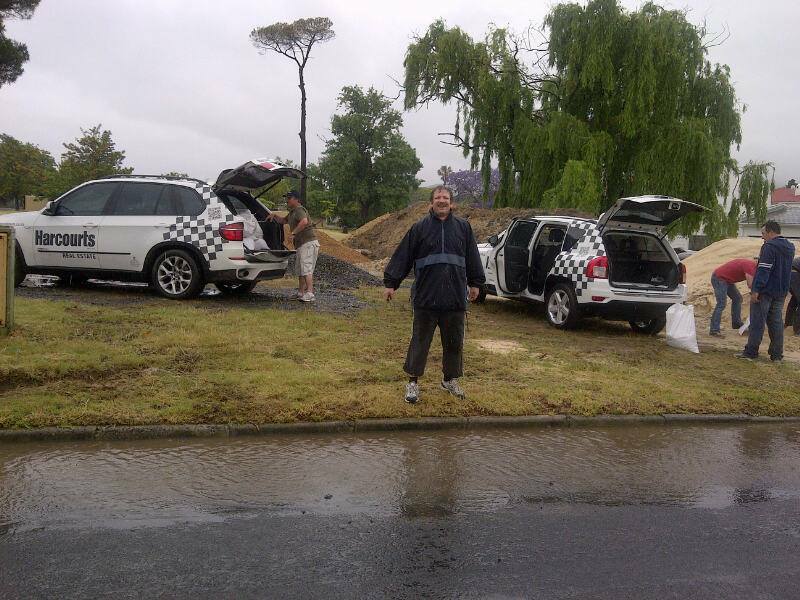 The Somerset West Facebook page was “flooded” with offers to assist those in need. Calls went out to evacuate Vergelegen Medi-Clinic, and many responded. Early on Saturday morning I drove through Bizweni and Bridgewater to observe the damage, and witnessed entire communities coming together to help their neighbors. When I offered help to residents most of them commented that they had already been helped! Together with some Harcourts colleagues we filled sandbags to assist some property owners living along the Lourens River. Friends and neighbors were there in full force to help offload the sandbags and protect the properties from further damage. It was wonderful to see and many locals were on an emotional high at being part of the solution, not the problem. It’s a credit to the Helderberg area that residents are able to unite and assist others in times of crisis. It didn’t matter whom you voted for, where you went to school, what language you spoke, or what race you were – if you needed help then others would offer it. People focused on what really mattered: people. It made one proud to be a local. Now that the waters have receded the challenge residents face is to retain that sense of community. Instead of airing grievances about all the problems we have to live with, wouldn’t it be refreshing to focus on the positives? There are many individuals who give selflessly of their time and energies. What made the relief effort so special was the fact that most of the community did this – it became the norm, not the exception. We are so privileged to live in one of the most beautiful spots on the planet. But what makes’ living here so special is more than just the surroundings – it’s the people. Let’s not forget what it feels like to experience the power of a community that comes together for one common cause. It shouldn’t take a crisis to make this happen. So what has this got to do with property? We purchase houses, but we live in homes. A home is more than a house. It encompasses a way of life. It includes the benefits of living in a community that shares our values and respects others. The world we live in has serious issues to contend with. We will not fix them here. But we can all do our bit to contribute to a society that lives by the code: “Do unto others as you wish them to do to you”. We felt the benefits of this through a time of crisis last week. We shouldn’t have to wait for the next crisis to experience this again. Let’s all do our bit to better our community and enhance the lifestyle we enjoy in this place we call “home”. Next Post Are Developments Good or Bad for your Property Value?